The best view for Total Solar Eclipse 2016 will be from North Maluku as weather prospect is better comparing to Sulawesi, Borneo or Sumatera. Ternate will become the first gate to reach this province either by air or sea. From here you can choose to stay and watch the eclipse from Ternate or moving to another city such as Jailolo, Tidore, Kao, Buli, Sofifi or Maba. During Total Solar Eclipse 9 March 2016, several cities in North Maluku will experience totality including Ternate and several islands such as Tidore, Mare, Moti, and Makian. The centerline is located between Moti and Makian. As the moon passes between the Sun and Earth, total darkness will come for 2 minute 35 seconds in Ternate and 2 minutes 59 seconds in Tidore. Best location to view the eclipse from ternate, Tidore, Mare, Moti and Makian are from the east-southeast side of the islands. The local government are aware of the eclipse and will prepare all the site that can be use to watch the totality, mostly from the beach. One thing to remember, Gamalama volcano in Ternate is actively erupts every few years. If you want to have some venture in Halmahera, the largest island in North Maluku then some part of the island will also experience total eclipse while other part of Halmahera will experience partial eclipse. 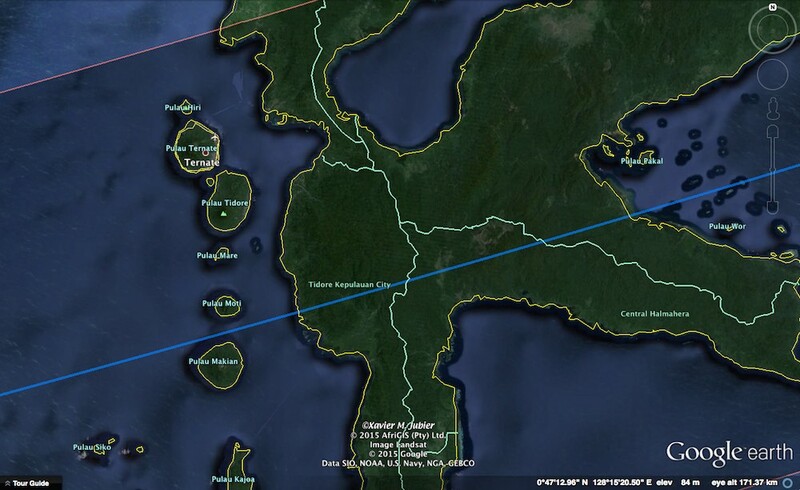 The advantage of observing the eclipse from Halmahera is you can reach the centerline as well as the northern and southern limit of the totality. Ternate can be reach by air or sea. There are several daily flight from Jakarta as well as other cities to Ternate. The route to Sultan Babullah Airport served by Garuda, Sriwijaya Air, Lion Air, Sriwijaya Air, Wings Air, Express Air, Trigana Air. The seaport in Ternate can be reach by ship and from Manado, there are daily ferry serving this route. From Ternate to Tidore and other islands, you can take the speedboat.